Full disclosure: I’m a born and bred New York stater. I grew up eating bowls of cereal for breakfast on weekdays– I especially loved the free junky ones that came in the mail sometimes– and pancakes or bagels on the weekends. Sometimes we had danish or donuts or eggs or oatmeal or hash browns from McDonald’s, but it wasn’t until I was a preteen traveling to Florida that I ever tried grits. At a Waffle House no less. 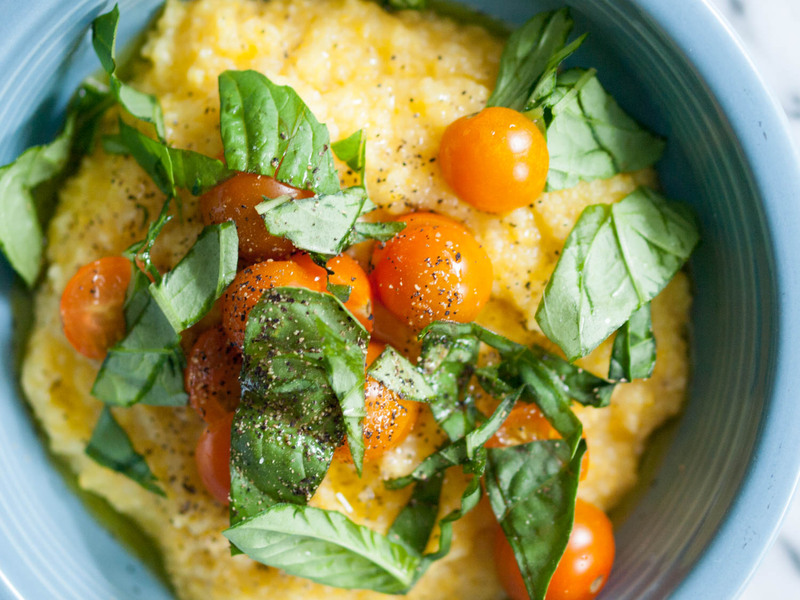 As an adult, my interest in that Southern staple was rekindled by Bryant Terry’s books (particularly this one) and a new found love for polenta (make this at your next dinner party. You’re welcome.). My own version of savory breakfast grits is super simple and full of summer flavors, decidedly inauthentic but definitely comforting, and utterly delicious. In a saucepan, bring 3 cups of water and salt to a boil. Add grits and reduce heat. Cook for about 5 minutes, stirring somewhat often. Remove from heat, stir in nutritional yeast, cover, and let sit for a few more minutes. Stir again, then serve topped with chopped tomatoes and basil, drizzled with olive oil, and seasoned with salt and pepper. This entry was posted in Breakfast/Brunch and tagged gluten-free, vegan on August 27, 2016 by Sarah. From bread to butter to fritters (um heck yes), zoodles, and more, zucchini is pretty much everywhere these days. 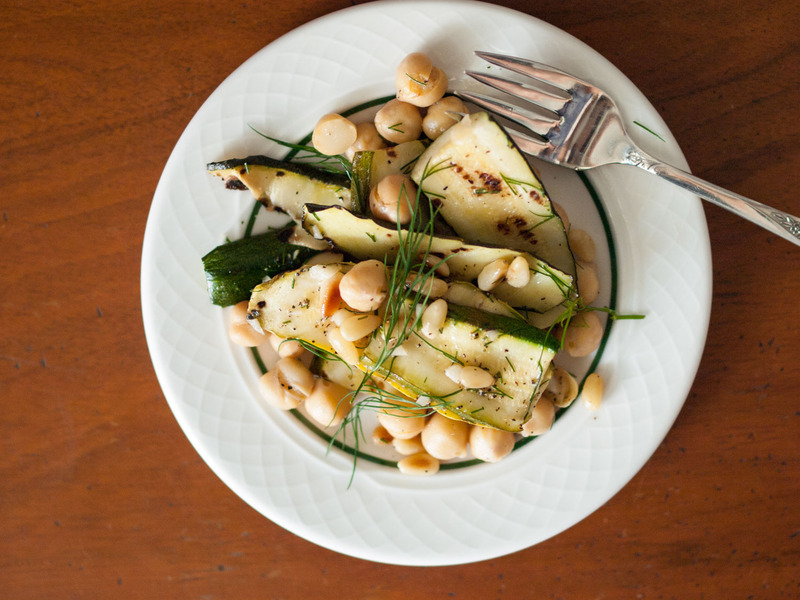 Right now, however, my favorite way to enjoy this ubiquitous summer squash is grilled. 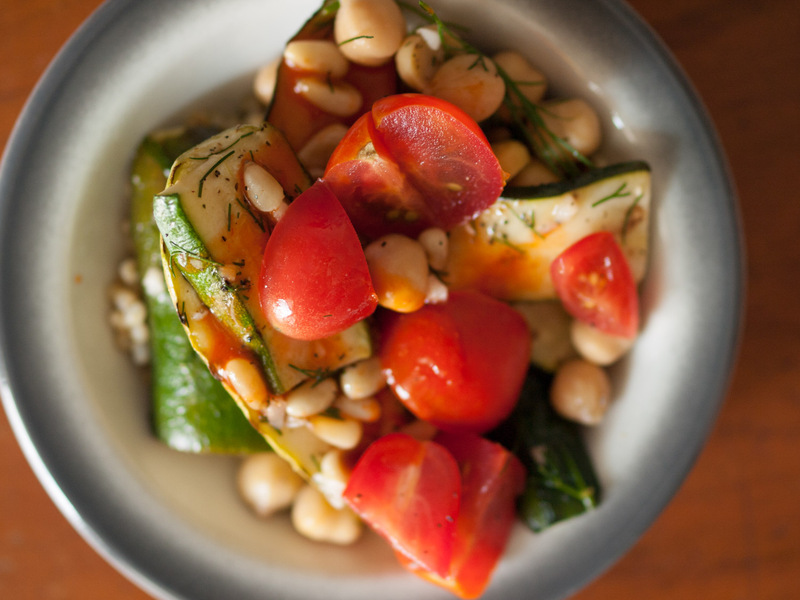 Tossed with olive oil, lemon, chickpeas, fresh dill, and toasted pine nuts, it makes for an easy and refreshing, thoroughly summery dish. Enjoy as a side, or make it a full meal by adding some grains and/or crusty bread. We had it over sorghum, topped with tomatoes, Cholula, and more extra-virgin olive oil– a combination I highly recommend! *If grilling on a regular grill, simply toss the zucchini slices with a little high heat friendly oil instead of spraying on the grill itself. *To toast the pine nuts, heat in a dry skillet over medium heat for a couple of minutes, watching closely, just until lightly browned and fragrant. In a bowl, toss chickpeas with the red wine vinegar, minced garlic, and some salt and pepper. Set aside to marinate. Heat a grill pan over medium heat. When hot, spray with some cooking spray. 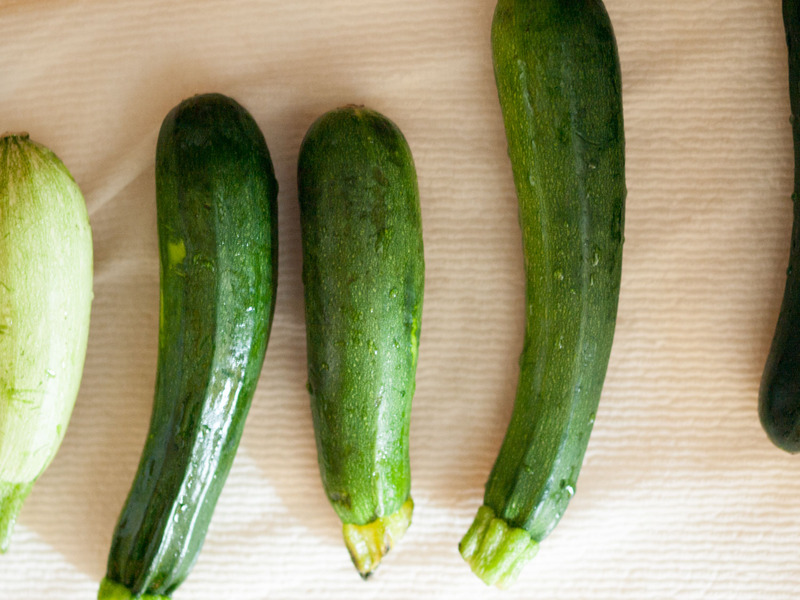 Cook zucchini slices , about 3-4 minutes per side, adding more cooking spray as necessary. 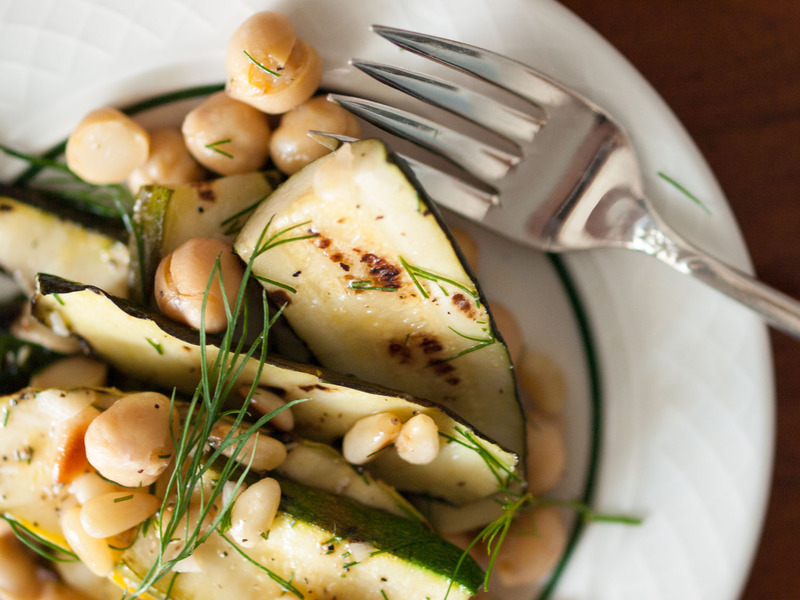 Toss grilled zucchini with chickpeas, olive oil, lemon juice, chopped dill, and toasted pine nuts. Season with salt and pepper and garnish with extra dill fronds. This entry was posted in Salads, Sides on July 21, 2016 by Sarah. I know, I know… another recipe with snap peas and garlic scapes. In my defense, though, these ingredients rock– and I encourage you to savor them while you can. I love garlic scapes because they lack the pungency of cloves, which can be overpowering in large amounts, yet still have plenty of savory flavor. 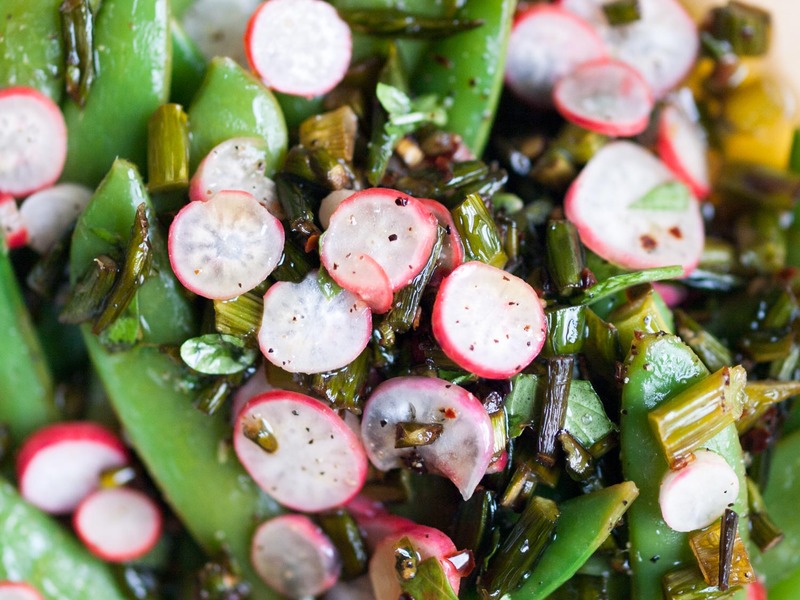 They very much hold their own with a certain verdant brightness and sweetness from sautéing that pairs deliciously with tender-crisp snap peas, radish, and basil. Heat a pot of salted water over high heat. Prepare a bath of ice water. 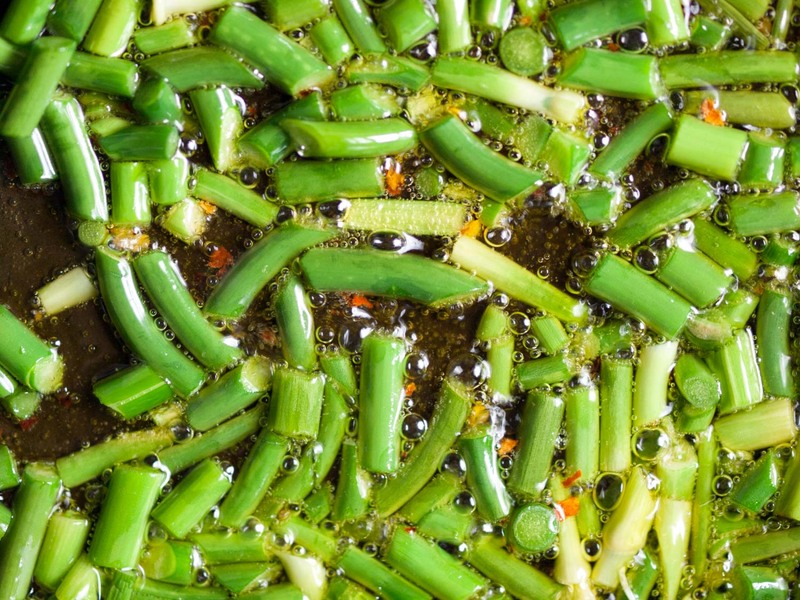 When water reaches a boil, add snap peas and cook for about 4 minutes. Drain and immediately transfer to ice bath to cool, then drain thoroughly. Meanwhile, heat some olive oil in a pan. Cook garlic scapes and red pepper flakes over medium low heat, stirring now and then, until golden brown, about 5-7 minutes. Toss cooled snap peas with garlic scape-oil mixture, radish slices, and lemon juice; season with salt and pepper; and garnish with basil. This entry was posted in Sides and tagged gluten-free, vegan on July 14, 2016 by Sarah. Maybe it’s because I indulged in an exquisite green tea macaron from Confectionery last week. Or maybe it’s because right after that Phil and I got sucked into a documentary on the Japan channel (and now I want to go live in the Japanese countryside and farm heirloom rice and drink from natural spring waters and make my own miso with adorable, healthy food loving children). Or maybe it’s because it’s summer and hot AF and I’m craving fresh, clean flavors. Whatever the reason, I’ve had whipped matcha coconut cream on the brain. I had originally intended to serve it with raspberries, but the blueberries at the market just looked so much better (and yes, they were cheaper). I still think this would be good with raspberries, and probably peaches as well, but I urge you to try it with blueberries. The flavor combination is sublime. Turn can of coconut milk upside down and refrigerate for at least 24 hours. Remove can from refrigerator, turn right side up, and open. Slowly pour out the watery liquid, and set aside for another use. Scoop out the thickened cream and place in a medium bowl along with the matcha and sugar. Use a hand mixer (or stand mixer with a whisk attachment) on speed 2 to whip the mixture until fluffy, about 3 minutes. 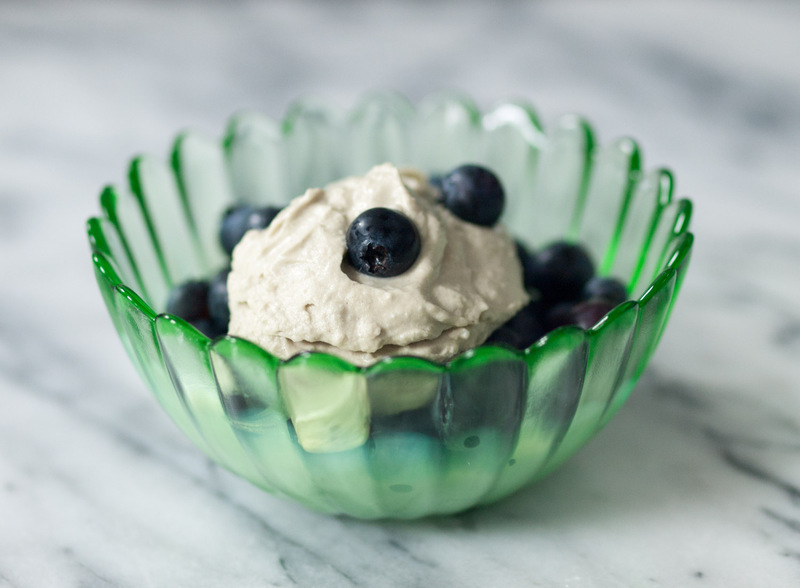 Serve as a topping for berries, or refrigerate until ready to use. The whipped cream will firm up significantly in the fridge, so you may wish to re-fluff it with the mixer just before serving. This entry was posted in Sweets and tagged gluten-free, vegan on July 8, 2016 by Sarah. There’s a comfort in ritual. For me, Sunday means farmers’ market. While I’m fortunate enough to have access to multiple greenmarkets throughout the week (hello, Union Square), it’s the smaller, slightly quirky one that I can breezily walk to without making a day of it that is dearest to me and the one I get most excited about. Phil teases me for this (and we laugh about this Superbad scene often), but even he has to admit that the fresh, local produce this time of year is pretty wonderful. He also loved this dish– which is pretty damn seasonal. *If you can’t find garlic scapes just use 2-3 regular garlic cloves, thinly sliced, and watch very closely while cooking. 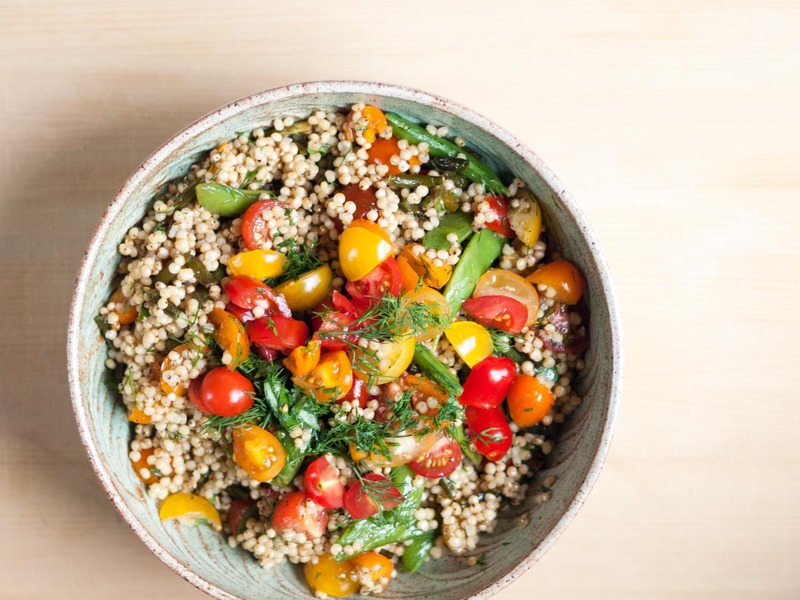 *You can also substitute farro, wheat berries, or pearl couscous for the sorghum (though note that the recipe will no longer be gluten-free). Place sorghum, water/stock, and a drop of olive oil in a saucepan and cook over high heat until boiling. Cover, reduce heat to low, and cook for about 50-60 minutes (mine took 60) or until tender but still a little chewy. Drain. Meanwhile, drizzle some olive oil into a large pan and cook garlic scapes and red pepper flakes over medium heat for about 5 minutes, stirring now and then. Add snap peas, turn up heat a bit, and cook, stirring as needed, for 3-5 minute, or until snap peas are just cooked through. Add snap peas and scapes to sorghum, and toss in the tomatoes and dill. Season with salt and pepper. Serve warm or cool. This entry was posted in Salads, Sides and tagged gluten-free, vegan on June 17, 2016 by Sarah.